The Cardinals still need a kicker. That’s easy to see, when the lone kicker on the roster — Neil Rackers — is an unrestricted free agent. 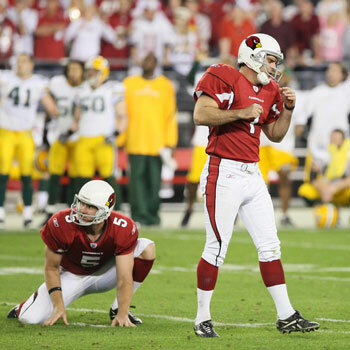 Foxsports.com reported veteran kicker Jay Feely is due in for a visit to the Cards this weekend. That comes on the heels of general manager Rod Graves acknowledging earlier this week the Cards were still talking with Rackers. I’m not sure if the Feely visit is because of anything changing with Rackers or if it is just the course of business until the Cards get a kicker under contract. Feely will be 34 in May, and had a good season for the outdoor New York Jets in 2009, making 30 of 36 field goals (and all 32 extra points).He was 12 of 15 from 40 yards or longer. Rackers, who will be 34 in August, was solid last season too, aside from when his groin injury was wreaking havoc on his play. He only tried 17 regular-season field goals, making 16. Of course, everyone remembers the miss to end regulation against the Packers in the playoffs (below) and his issues in the Saints’ playoff game (although his leg had given out because of his injury in that game). It’ll be interesting to see how this develops. The things that make Rackers so valuable — his quirky ability to do crazy, effective onside kicks and his kamikaze willingness to tackle on kickoffs — are also the things (because of the mentality needed) that give pause when it comes to the end of games. Personally, I hope Rackers returns, because he is a weapon in so many facets. But that’s far from a lock right now. I don’t know…He has been good at times for us but there have been many games the last few years where he has had a chance to win it and he missed. Not just the playoffs this year, but last season too. I don’t think he is a “clutch” kicker. But as Urban pointed out he does add an extra tackler on special teams and is very effective with the onside kick. That being said i wouldn’t be opposed to signing Jay Feely if its for less money. RACKERS IS NUMERO UNO!!!!!!! Literally his number is #1. Any news on NINE-0 big announcement yet URB ? When are you gonna do your annual mock draft??? rackers is by far the best kicker available and i think it would be a huge mistake to NOT resign him. his value isn’t just about field goals like you said darren and he’s the best in those regards as well. Good article Darren, I am thinking that DD’s news was that of the GM for the 49ers getting fired… any update on what it meant for sure? I would be shocked if that was Dockett’s news. Until he tweets, we won’t know. I know there are some people who won’t forgive Neil for missing the kick against the Packers (which they should because we won the game anyway), but I’d love to see him back. He’s been with us since 2003 and has given alot to this organization. He still has a big leg and the capability to hit from 50+ consistently, unlike 34-year-old Jay Feely. We’re going to be kicking more field goals with Leinart as the QB. He has advantages that no other kicker has with his onside kicks and tackling, and I’ve always been a fan of his. BRING HIM BACK. Rackers has been good for us but the injury did put him back a bit. I know Whiz and Rod will do whats best. Definitely hoping for Rackers return. Even great kickers miss sometimes, it just happened to be at a very important some time. But thats all a-okay because defense finally stepped up and won it, so I don’t blame Rackers. He’s one of the best kickers in the league, if not the best, and resigning him would be a very smart move. I swear watching Neil Rackers on kickoffs is a sight for the eyes. Outta nowhere this guy makes tackles and spears special teamers head on. I like Rackers and we def need to resign him. When he is kicking there is truely 11 men on the field vs 11 men. Also, like you mention URB, his crazy onsides are extremely effective when he is healthy and I remember the game when he placed the ball on the tee on kickoff and starts to walk back to line up for the kick, he turns quickly and unexpectedly and fires off an onside NO ONE saw coming. Those types of plays are fun to watch as a fan ESPECIALLY when they work. Losing Rackers would be just another hit to our hearts as fans. I saw on NFL.com that they have a poll as to which free agent will help thier team more. 3 of the 4 are former cardinals and thats the alst thing you want to see after 2 division championships, 1 superbowl apperance and 2 years consecutive playoff apperances…. Rackers is kinda like Boldin – great Cardinal, great contribution, great guy – time to go. Feely is an upgrade as a pure clutch kicker. I really hope Rackers comes back! He is by far one of my favorite players on the roster and overall. Darren, I looked over quickly some of Rackers stats. Do u think that maybe the Cards. may sign both Rackers and Feely, using Feely for longer FG’s like so teams do already? Just a thought. I didn’t check Feely’s stats on long FG’s. No. They will have one kicker. Roster spots are too valuable. Since Rackers’ unreal 2005 season, when he made 6-of-7 from 50 yards and beyond, he is 5-of-18 from that distance and didn’t try and 50-yarder in the regular-season in 2009. Something to keep in mind. I like Rackers, I think he’s a great kicker, however I can think of 4 times right off the top of my head where he’s missed game tying/winning field goals (Green Bay, Washington, Baltimore, Chicago) and can’t really recall any game winners. Maybe a couple, but I think he folds under pressure. I’d like to see them bring someone else in. When has Rackers missed game-winning kicks? We rarely need him in game-winning situations, so the last time I remember him missing a “clutch” kick (other than the Packers game) was 2 years ago on a FG from 53 or 54 yards (can’t remember who it was against). He’ll be fully healthy and ready to go during the season. Rackers is effective with the quirky kicks but when the money is on the line he can’t be counted on. His MO is to miss pressure kicks. That is how we got Rackers in the first place from Cincy. I’d rather have a guy that can put the ball between the uprights when it counts than a kicker that will run down the field and run into the kick returner. Get a kicker that can kick extra points. Score more touchdowns! That being said the Eagles released DE Darren Howard. Living on the East coast and being forced to watch most of the Eagles games, Howard was underutilzied yet productive (my opinion). Any interest on the Cards part or too early to tell? Not sure Howard fits in a 3-4 defense. Hey Darren, do you know which pro days the AZ scouts will be attending or is that generally kept under wraps? Generally, the Cards will have a representative at most of the “big” pro days. But specifics are indeed kept under wraps. u think the cards front office might look at kevin curtis he wont want much.. from what they say.. Doubtful. Not sure Curtis is ready to be a No. 4 at this point. So long Charlie Brown….I mean Neil Rackers. This guy chokes when we need big time kicks time and time again. We need a clutch kicker. I’m not sure. Elam seems to be nearing the end of his career. Yeah, it’s been an interesting journey with Rackers. I don’t think I’ve ever liked a kicker more than I’ve liked him. He’s got a linebackers mentality ( how can ya NOT love that in a kicker??? ) and he can be a real weapon on special teams. Remember that pooch kick in Seattle last year that got us off to a 14-point lead before the Seahawks had even run their first offensive play??? THAT was pretty cool. He did the same thing against the Eagles in the NFC title game and we should have gotten that one, too, but the refs blew the call. But when he misses…it happens at the worst possible times! But, hey, that happens with any kicker at some point. It’s the nature of the beast. I hope he stays with the Cardinals but kickers are probably the most easily replaceable position on any team. That’s also the nature of the beast. Darren, I agree – keep Rackers. Mel Kiper and Todd McShay both think Jerry Hughes from TCU would fit our defense well. What do you think? I think I can see Hughes as a possibility in the first round. You’re right. He knew that he was going to be an UFA and he missed a clutch kick against GB. Kind of sad given all of his tackles on some really pathetic special teams. Maybe one of the best on sides kickers ever, but we need someone who can come in on time and make the kick. Oh and by the way given that of the 100+ div 1 schools there are only 40 or so kickers who can regularly kick beyond 50 yards, how can you justify 1 million for a kicker. Hughes really? That would be ok. Of course it’s all a guess at this point. Even for the people that get paid to guess. I think Howard is a football player, and versatille. Just an a opinion. Rackers is not only the best player on the Cardinals, he’s been the best player in all of football since he came into the league. If the Cardinals decide not to re-sign him there’s going to be a lot of disappointed fans here in Santa Maria. Bring Rackers back to the team. And be hard on him. Whenever he misses a kick in practice, make the whole team do laps around the football field. Sense hes under pressure, and hes in practice… This will all make sense. I like Rackers, I hope he stays but really it is hard to get excited about a kicker either way. Wells, Fitzgerald, Dockett can be difference makers but a kicker pretty much is a kicker. Feely is good, but Rackers is that last tackle effort. Imagine how much kickoff TD were saved because of Rackers. Good poll question however I find it interesting that 1/2 of the voters chose Larry as the most intelligent use of a draft pick. I’m curious though, if the cardinals held an auction today and put the seven players listed on the open market, which player would generate more of a return compared to the initial investment. I thought Darnell Dockett by far was the better choice considering how he turned out. It’s about value. Fitz of course is a great pick, but he was third overall, for goodness sake. He should be good. It’s hard to go against A-Dub or Dockett, and given that Adrian is a three-time Pro Bowler and was slightly later in the third round, I suppose I’d go that way, with Dockett a close second. But each of those guys definitely qualify. In my book A-Dub and Dockett are tied…shows how much value you can still get in the third round…excited about this draft!! As for kickers, Rackers would be preferable…hopefully, he won’t buckle under pressure!!! As I mentioned on the other thread, be careful about playing fantasy football here. The Cards got Rhodes, they have no need for Sharper. If these guys were younger, I’d understand but you sound enamored with name recognition rather than what those guys might actually mean to the team on the field. when he’s healthy he’s one of the best in the league. bring rackers back. You are right, Adrian Wilson is in the 20/20 club and has a good chance to be in the HOF, anytime you could draft a HOF player in the 3rd round, that’s a smart pick. To clarify, my follow up yesterday was only a joke. Now for a real question, if you had to give a % to how sure you are that Rackers will be back, what would you say? And do you give him the benefit of the doubt like I do with the Packers kick, because of the rushed situation and everything? Ahh, the dreaded percentage question. Considering I am not in on the contract talks, I’m probably not a good person to narrow it down. If I say 50-50, will you hold it against me? (If I had to shade it one way or the other, I’d probably lean toward a new kicker, but not by much). As for the Packers kick, I know he was rushed. But I watched the replay enough times — and knowing it was, what, 35 yards or so — to see he had enough time to compose himself. I think he has to make that kick. And I think Neil would tell you the same thing. I know Neil personally and he and I have been workout partners “off season” for the past 2 years and I can only tell you that a man like Neil is a true asset to any team. His aggressive nature on the field is topped by no other kicker out there. He is a kicker who can bench press more than 300lbs and wants to use that strength to hit anyone who returns one of his kicks. He is accurate when 100% healthy. I worked with Neil after his injury and he was totally committed to returning to play with a stronger and more accurate leg, and he did. He was returned to the field too soon after his injury, not allowing it to heal completley. I think we need Neil to stay in Arizona and not even consider another kicker. Neil is the Cardinals Kicker and should stay that way. No problem, 50/50 is fair. I tend to give my favorite players the benefit of the doubt. I would be willing to take the risk of a miss once in a while for everything else he adds. He is the best in the league at onside/pooch type kicks. And I want him to be a Cardinal when he gets his forced fumble returned for touchdown. Except for seven or eight draft picks and 10 to 12 rookie free agents, the Cards Roster is essentially complete. Ware, Rackers, Morey, Kreider and Robinson will probably sign. After that when we sign a player we’ll be cutting a young player from the Roster. I remember when the Cards cut Jeff Christy right after he was drafted him to keep an older lineman who played one year. Brandon.. he was 16/17 in regular season. The one he missed was kicked from 40-49 yards out. The year before he was 25/28 and one of those was from 50+ yards out. 2009 and 2008 were his 2nd and 3rd best seasons, respectively, percentage-wise. How does that qualify as missing “many”? I love Rackers, but he has missed some big kicks for us. Another example is 3 seasons ago at home against San Fran…it was like a 32 yarder with the game tied…end of regulation…at the end of the game…the crowd was starting to trickle out thinking it was over…he missed it and we ended up loosing in OT which could have set us up for a playoff run that year (finished 8-8). Like I said, I love the guy, but as long as we got a more accurate kicker, I wouldn’t be completely devastated. I think Rackers needs to stay. I mean look at how many times one of his infamous kickoffs completely changed the game. I still remember his mortar kick in the Seattle game. I had to listen to it on the radio, and you could hear in Wolf’s voice how exciting it was. Also, Racker’s is fairly accurate and has a really strong leg. I mean he’s a kicker. How difficult can it be to hammer out a contract? None of them make much anyway. Rackers stinks and we don’t wantg him back. He chokes under pressure especially when the game is on the line and i’m not talking about 50+ yarders, chip shots ! Cardinal fans have no faith in him anymore and the Cardinals should feel the same way. Bring Mike Nugent back, he’s more reliable . He is better then Rackers as is Feeley and most others !